(perhaps generally so for 5-HT-acting antidepressants). Some of the side effects of SSRIs are considered to be mediated through 5-HT2A receptors, so a 5-HT2A blocker would reduce them.33 The two compounds yield the same compound on N-dealkylation. 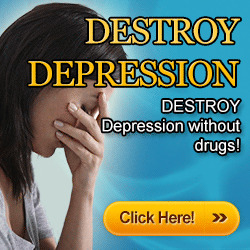 It is a serotonin reuptake inhibitor. The most common use of trazodone is not as an antidepressant. A 100-mg dose can be used as a sedative-hypnotic. Despite this use, it has been shown that nefazodone produces better sleep hygiene than does trazodone, which is a rapid eye movement (REM)-suppressing compound. The mechanism of action of bupropion (Wellbutrin) is considered complex and reportedly involves a block of DA re-uptake via the dopamine transporter (DAT), but the overall antidepressant action is noradrenergic. A metabolite that contributes to the overall action and its formation can be easily rationalized. Oxidation of one of the methyl groups on the f-butyl substituent yields hydroxybupropion, an active metabolite. Reduction of the keto group also occurs, yielding threohydrobupropion and erythrohydrobupropion. Both of these metabolites are also active. Hydroxybupropion is half as potent as the parent bupropion, and the hydrobupropion isomers are five times less potent. 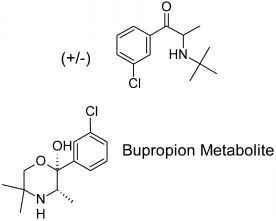 The presence of these metabolites, especially hydroxy-bupropion which is formed by cytochrome P450 2D6 (CYP2D6), suggests that there will be a myriad of drug interactions with bupropion. 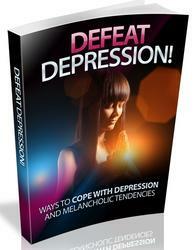 Duloxetine (Cymbalta) is a newer antidepressant. It is largely like venlafaxine, which is an SNERI (selective nor-epinephrine reuptake inhibitor).